n August 20, the Inuit man whom they had engaged as pilot was taken ashore in the ship's boat to get his kayak. The five sailors manning the boat were instructed to set him ashore in sight of the ship, but they rowed around a point of land to the Inuit village. Neither they nor the ship's boat were seen again by the English. Frobisher anchored and sailed nearby for two days, firing cannons and blowing trumpets to recall the men. Unsuccessful in this, he tried another tactic. 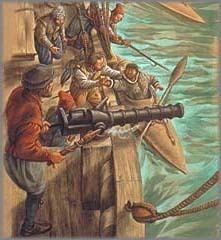 After luring an Inuit man close to the ship, Frobisher picked him and his kayak from the water and held him hostage for the return of his men. The kidnapping did not have the success that Frobisher hoped. 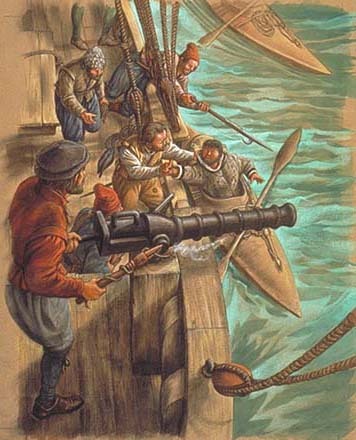 "But these foolish men, being five of them in all in the bote, having set on land this stranger at the place appointed: the capitayn being in the ship saw them quietly put of their bote, and immediately contrary to his commandment and charge geven they rowed furder beyond that poynt of the land owt of his sight, and there landed iij of them, and the other twayn rested in the bote a little from the land so as he saw them agayn, to whom owt of the ship they made signes and noyse as well as they could to call them to the ship. And immediately these two men with the bote rowed into the land agayn to their fellowes owt of his sight, and after that hower he never saw them, nor could hear anything of them. And thus the capitayn having lost his bote and five of his best men, to his great discomfort he still remayned with the ship there at anker all that day and next night hoping to here of them agayn. But he could not here or know anything of them: and thereby he iudged they were taken and kept by force."